What is Amias used for? How do you use Amias? Amias is an angiotensin II blocker: This drug lowers your blood pressure. 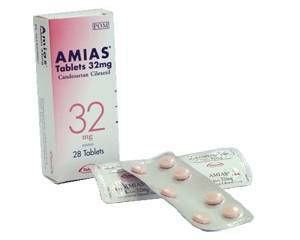 Amias contains the active substance candesartan cilexetil. Amias is prescribed by doctors for high blood pressure (hypertension) and heart failure. Take a tablet at a fixed time. If you experience dizziness in the beginning of the day, it is better to take Amia at night. Amias is available in tablets of 2, 4, 8, 16 and 32 mg. Thedoctor will decide which strength is right for you. The usual dose is one tablet per day, unless the doctor tells you otherwise. If you forget to take a dose, you can still take it until 16 hours afterward. After this time it is better to skip the missed dose (see leaflet). Warn a doctor when you overdose. flu-like symptoms (cough, runny nose, sore throat, sweating). An overview of (other) side effects can be found in the leaflet. Talk to a doctor if you experience severe side effects, or if you notice any side effects that are not listed in this leaflet. patients with liver disease or renal impairment. In any of these cases, consult with a doctor about the use of Amias. Amias can endanger the health of a (unborn) baby. Do not use Amias if you are pregnant or want to become pregnant, or if you are breastfeeding unless your doctor specifies otherwise. Talk to the doctor or pharmacist if you are taking any of these drugs or other medications. Amias lowers your blood pressure, which could cause dizziness in the beginning. This usually disappears once your body is used to lower blood pressure. Then you can drive a car again. Alcohol increases the effect that Amias has on blood vessels. This may cause or increase dizziness. Moderate or discontinue the use of alcohol to prevent this.